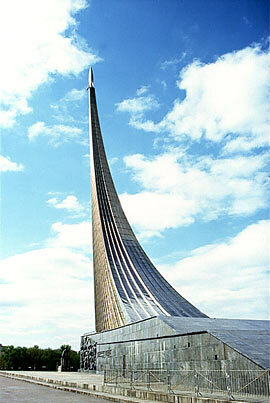 The monument was built in 1964 to commemorate the launch of Russia's Sputnik, the world's first artificial satellite. The monument's granite pedestal is graced with a statue of Konstantin Tsiolkovsky (1857-1935). To the Conquerors of Space, an enormous silver rocket soars into the sky on a 100-meter tall stream of glistening Titanium . The Cosmonautics Museum traces the history of Russian rocketry and space exploration from the 1920s to the present day.